Spanish ham (jamón) is greatly prized as a gourmet food both in Spain and around the world. It is eaten regularly in most Spanish households. There are various types of cured ham in Spain, ranging in price from economical to very expensive and they are quite accessible, carried in grocery stores, sausage shops, and supermarkets. Ham is a historically important food, dried and cured with salt for centuries. The people of the Iberian Peninsula ate pork and ham in their diet, even in the Roman era. However, when the Moors conquered the Peninsula, because of their religious beliefs, eating pork was prohibited. After the Christians regained control and forced the Muslims and Jews to either convert or go into exile, pork regained its popularity. There are almost 2,000 producers of serrano ham in Spain. Eighteen of these producers formed the Consorcio de Jamón Serrano Español in 1990. The name jamón serrano is now controlled by the European Union since the year 2000 and it protects the processing of this product, although it does not apply to a specific region. Look for the label that has an "S" in the shape of a ham, and says SERRANO ESPAÑOL if you want to buy jamón serrano from the consortium. The mountain or serrano ham is made from several different breeds of white pigs, such as Duroc, Landrace, or Large White. They are fed mainly cereals and cured from 7 to 16 months. Jamón ibérico, as the name suggests, is made only from the Iberian pig. The breeding of the Iberian pig is restricted to an area in Southwestern Spain and Southeastern Portugal. Although fed some cereals, these pigs also roam the countryside and feed on acorns. The curing process for jamón iberico lasts from 14 to 36 months. Ham is such a treasured food that not only are there several Denominations of Origin, but there is even a chain of Museos de Jamón or “Ham Museums” around Spain. The Denomination of Origin of Teruel (in Aragon) was the first granted by Spain’s Department of Agriculture in 1984. Since then, other Denominations of Origin for ham have been granted. As with all Denominations of Origin, there is strict control of the quality of the product. For example, in order to carry the name jamón de Teruel, the regulations of the Denomination of Origin of Teruel cover every stage of the process, including the following: The pigs must be of a certain breed, be fed only cereals and grains of the local region, be of a certain weight when slaughtered, and spend 14 months curing in Teruel. While curing, they must pass a number of quality control checks, as well. Where Can You Buy Spanish Ham in the U.S.? There are currently Spanish companies producing hams in strictly controlled, USDA-approved facilities. The price for a whole 20-pound ham can range from $180 to $300. Small packages of imported sliced ham can also be purchased for around $8. If that sounds a bit outside of your budget, don’t despair. 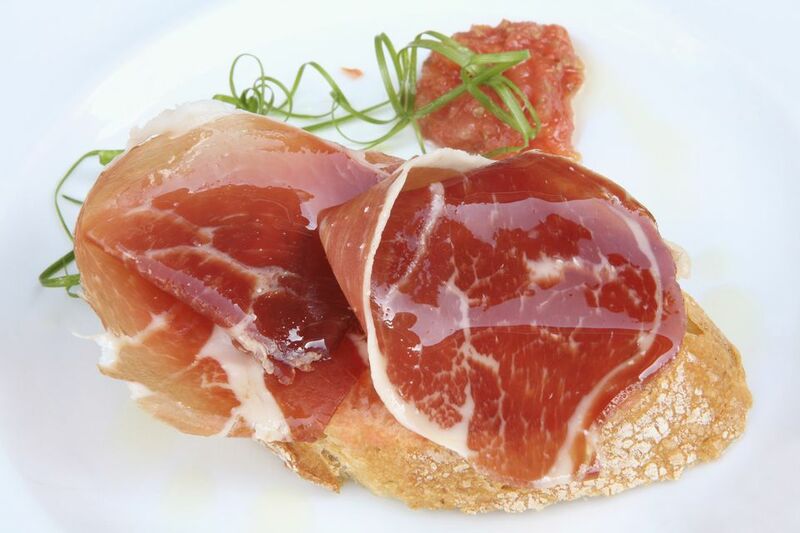 Another alternative is domestic Serrano-style hams that are air-cured for 11 months and lightly salted. You can find these whole hams (13 to 18 pounds) for around $12 to 13 per pound.